Apple TV set for major update? 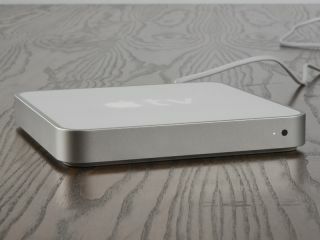 Apple TV - a new beginning? Apple TV could be set for a big overhaul, with the New York Times suggesting that the company could even bring in a customised version of its iOS operating system being used in the iPhone and iPad. With Google TV on the horizon and the BBC-fronted Project Canvas finally approved, it's an interesting time for IPTV, and Apple's platform could do with an overhaul if it is to stay current. According to the NYT, citing several unnamed sources familiar with Apple TV, the company is deep in development of the next generation of Apple TV. One suggestion is that the platform will be updated with iOS, which is currently running on iPhone and iPad, and that would make a degree of sense. With Apple's App store flourishing, and iTunes already well established as a media store, there is no reason why Apple TV could not quickly become a major player, if the company can work the magic that they have managed with mp3 players, phones and, lately, tablet computers. In the UK, Canvas is expected to do for IPTV what Freeview did for digital television – and make the whole concept of getting video on demand and streaming media through an internet connection and on to the television easier. That growth in public confidence could well both help Google TV and Apple TV, as well as provide a massive competitor. Apple TV arrived in 2007, but has never managed to have the kind of impact that the iPod or iPhone did - despite a loyal fanbase. But, the concept is a sound one, and the infrastructure is in place, which all adds credibility to the suggestion that Apple will make another push at a mainstream media box.